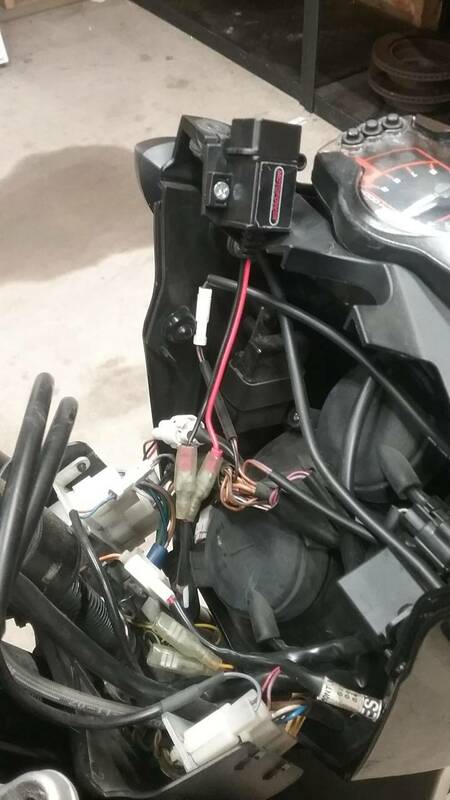 I put a usb charger on the instrument cluster for charging my phone while riding. I also put a ram ball using the front tank bolt. I use this for a phone mount with the x grip mount and go pro footage. I bought a trackside usb with an sae connector. I cut the wires and crimped some male spade connectors. These will fit in the accessory wires in the headlight cluster. 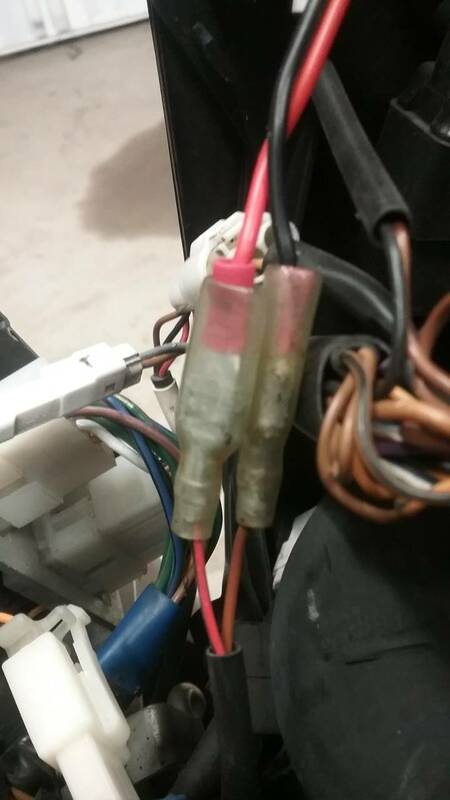 I choose the constant hot terminals because the usb adapter doesn't have any indicator lights to drain the battery, and any accessory that is plugged draws very little power. You could use the switched power source if you prefer that. 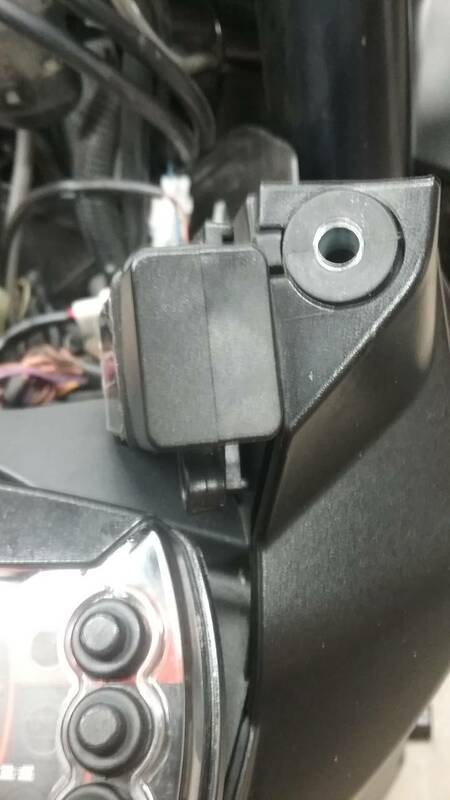 The usb is mounted with machine scews on the clutch side of the headlight plastic. I used the smallest drill bit that would allow the screws to make their own threads. Using a 1 foot usb cable is the perfect length. The usb has a waterproof plug. No issues with any clearance while turning. Be careful with your phone. You're subjecting a delicate PCB and solder connections to a host of different frequency vibrations. 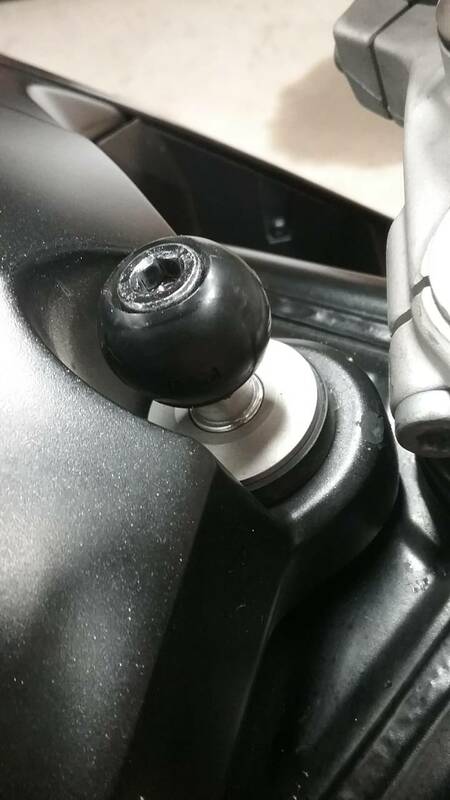 Pretty much everyone I know that mounts their phone to their bike starts to have camera related issues first then it deteriorates from there. Not to mention in an off you phone ends up who knows where instead of being on your person. Pretty sweet idea for a mounting spot though. Yes, nice location for the Ram ball. 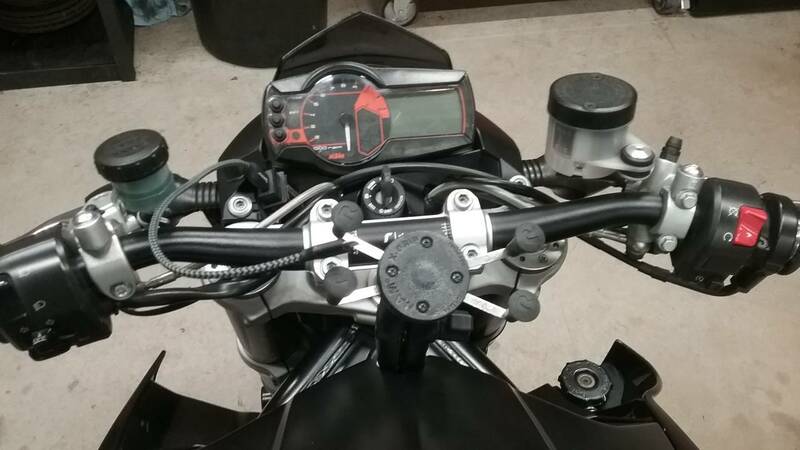 I have mine handlebar mounted for my Zumo GPS but that's better. I've lost my phone twice from the bike when it slipped out of my tank bag because I didn't zip up the top. Both times I got it back easily because I have 'Find my phone' app and so I just used someone else phone and it shows me exactly where the phone is on a map! Down to the last metre even. One the phone was buried in a hedge on a dual carriageway. The other time a school kid had found it and taken it to class. You should have seen the look on their face when I went into the classroom with the head teacher and asked for my phone back! Ha ha. bic_bicknell wrote: .... The other time a school kid had found it and taken it to class. You should have seen the look on their face when I went into the classroom with the head teacher and asked for my phone back! Ha ha. norman_2009 wrote: I put a usb charger on the instrument cluster for charging my phone while riding. I also put a ram ball using the front tank bolt. I use this for a phone mount with the x grip mount and go pro footage. Nice work, looks great. Thinking of doing something similar.............. one day. bic_bicknell wrote: Yes, nice location for the Ram ball. 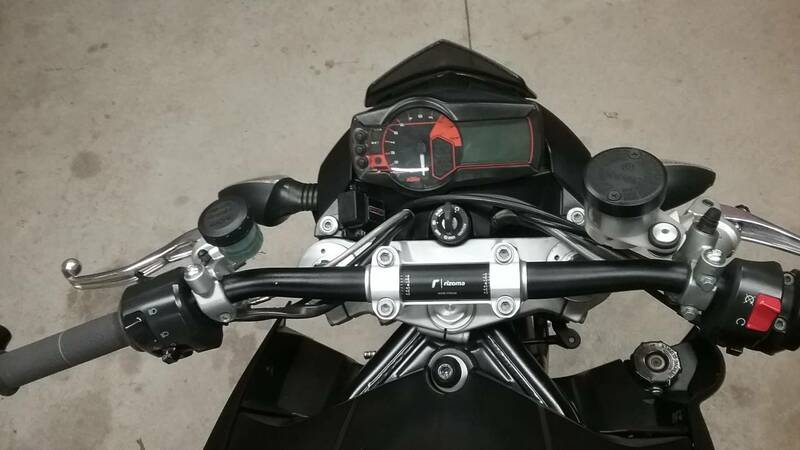 I have mine handlebar mounted for my Zumo GPS but that's better. Good point on the vibrations and phones. I've been doing this since I had a smartphone 6 years ago. All have not had any issues. I did just pick up a galaxy s8 this weekend. Now that phones are so expensive I feel reluctant to out this one on there. I only use the phone for navigation. I think I will keep my old phone just for navigation. Oh well I have all winter to decide. Aphex wrote: Be careful with your phone. Yep, all true. I killed Samsung S3 like that, as it couldn't stand the vibrations. 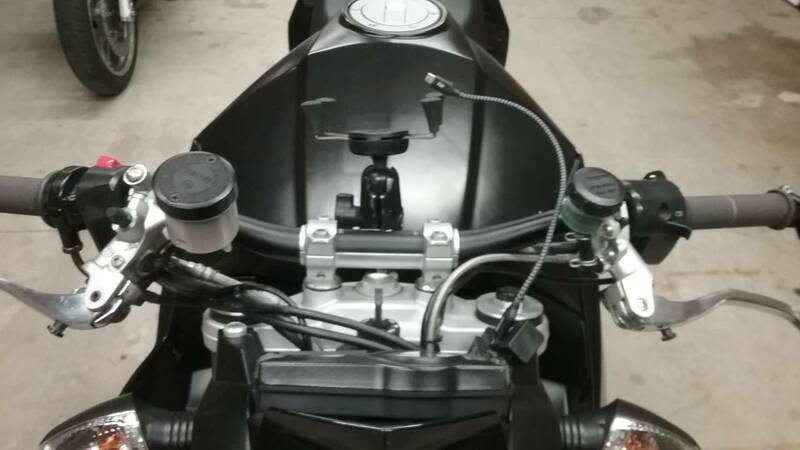 I had it attached to the handle bar using some smart sealed phone bracket. To be honest on twisted and often bit bumpy country roads the display was hard to read anyway due to huge vibrations. 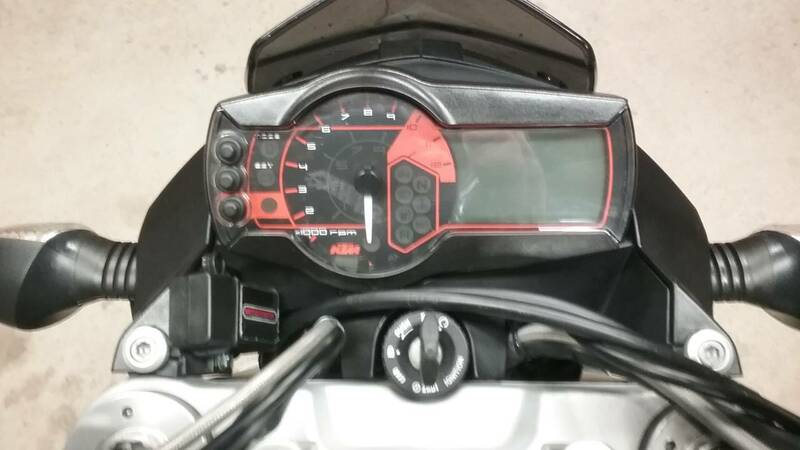 Ended up using sat nav via bluetooth intercom installed to my helmet with no view of the display. It works good enough. Both for GoPro and phone..